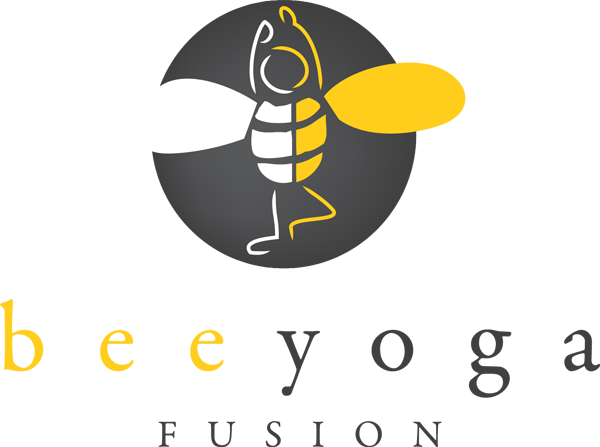 This turned out to be a really fun craft that all of the Bee Yoga Fusion YogaKids enjoyed. 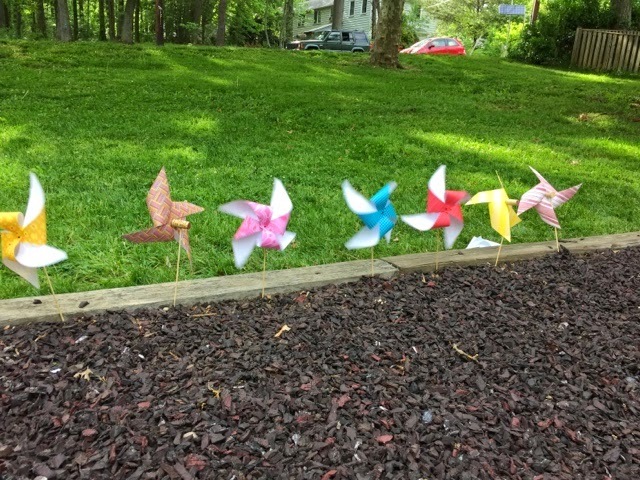 What I wasn't able to capture was all the kids running around the playground with their pinwheels held high over their heads trying to get their pinwheel to spin faster by running faster! Brilliant activity to get the kids up and moving! I conducted this craft with children in kindergarten through second grade. My YogaKids are seasoned crafters and have exceptional fine motor skills, please be mindful that this craft involves sharp objects and children must be monitored the entire time while doing the craft. Have the child fold their paper into a triangle by bringing to points together, make the crease and then unfold. Do it again for the other side then unfold. You should have a giant X made by the creases on the paper. Have the child draw a circle in the very center of the paper no bigger than a quarter. Cut on the line of each crease from the end of the paper to the circle and stop. To assemble the pinwheel, an adult will need to push the skewer into the side of the wine cork. You may need to begin the hole with a hole starter like you would in a wall depending on how dry the cork is. Moving on to the paper, grab a point and draw it into the center, skip a point and then bring the next point into the center. Continue in this manner until you are back where you started. Poke the sewing needle into the center of all the point tips at the center of your paper and through the main paper as well at the center of the original giant X. Your needle should be poking out of the back of the paper, place a bead on the needle and then gently push the needle into the wine cork. 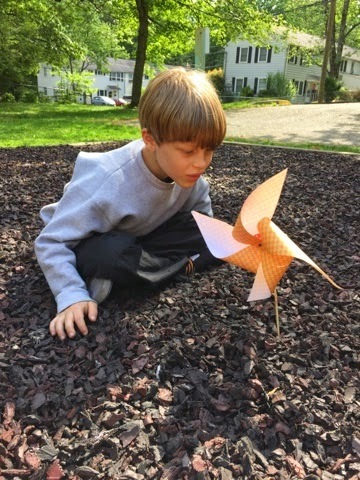 Of course the pinwheel is made of paper and this should go without saying but if left outside on a rainy night it will be ruined. This is a wonderful activity to do with kids of a broad age just remember that there is a needle involved so you may want to assemble it for younger kids and watch them closely while playing with it. 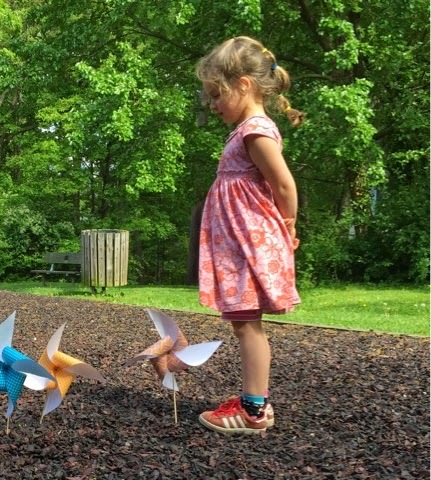 Older children will love the independance of being allowed to create something using sharp objects and the finished pinwheels bring out the kid in all of us.